Spring and summer in Central Texas (USA) bring unpredictable weather, and at times thunderstorms rage across the region, pounding the dry ground with so much water that parched riverbeds can suddenly become torrents in minutes, writes Don Papini, Martin Engineering Territory Manager. The warm seasons also bring humidity that averages more than 85%, which can make any bulk material containing clay or silica adhere to most surfaces. This type of accumulation created problems for the Hunter Cement Plant in New Braunfels,Texas, which consistently fought against penetrating humidity and marble-sized raindrops dousing the material on its partially covered D-07 conveyor system. Terminating in a chute that acts as a major transfer point, the wet material would clog the shaft and result in backups on the belt, leading to spillage issues that halted production. Martin Marietta took over plant operations in 2014, following a merger with Texas Industries (TXI), the largest cement producer in the state. Managerial inspections revealed that there were some improvements needed in the existing rotary feeder and chute system in order to reach continuous mill operation. Built in 1979, the facility had run on one kiln, producing 0.9mtpa (million tonnes) a year of cement. In 2012,TXI added a state-of- the-art second kiln, increasing the plant’s production to a total of 2.3mt annually. Limestone extracted from Hunter’s quarry eight miles away is protected from the weather in an enclosed 40,000-tonne on-site storage dome at the Hunter plant. There, it is crushed to a size of 6-inch minus (150mm) and mixed with clay, then conveyed to a processing tower. Separate conveyors deliver iron ore and sand to the same tower, where they are loaded onto a weight belt feeder system for precise measuring. Two chutes — one with limestone and clay, the other with iron ore and sand — offload 350 to 400 tonnes (317.5 to 362.8 metric tonnes) per hour onto the D-07 conveyor, mixing them together on the 42in. (1,068mm) single belt running at 350FPM (1.8MPS). The conveyor travels approximately 300 feet (91.4m) to an adjacent tower and offloads into a pyramid-shaped funnel, which feeds a chute with a flow control gate at the bottom that either diverts material to a conveyor leading to the raw mill or to a dump truck waiting on the ground below. In the Quadrapol mill, the mixture is ground to the kiln feed specifications of the grade of product to be produced. Once the material is offloaded from D-07 into the funnel, it drops 12 feet (3.65m) down a square 3ft by 3ft (0.91m) chute, onto the conveyor below. Operators found that wet or damp material gradually formed into a rat hole and eventually created an obstruction, which led to the material back-up. Operators explained that two or three workers would gather around the railing at the top of the chute and use air lances and pneumatic jackhammers fitted with 8-foot long bits to clear the obstruction. 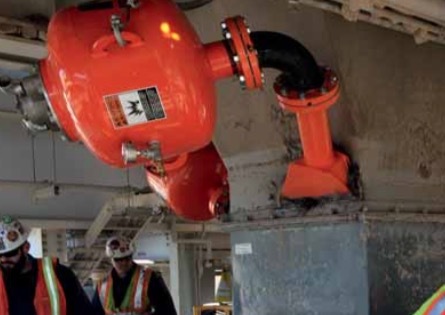 The Martin Engineering team and Martin Marietta management worked together to devise a solution using a series of Martin® Hurricane air cannons strategically placed along the chute. With more than 140 similar units already in place, aiding material flow throughout the facility, Martin Marietta decision-makers agreed with the conclusion. Martin technicians installed a total of five 70-litre air cannons on two levels. The 94 lb (43kg) tanks are suspended from the tower frame by steel cords and are fed by the plant’s existing compressor line. The powerful cannons fire a shot of air at up to 120 PSI (8.27 BAR) from a pressurized tank through a fan jet nozzle with a 12 inch (305mm) wide mouth, which spreads the stream across the surface area of the wall. To clear obstructions and assure proper material flow, the cannon has an effective area of up to 22.6ft3 (641 L). All fitted with a centrally located valve design, the tanks offer the most direct air path with the maximum force output and low air consumption. This efficiency reduces the burden on the compressor system and shortens the lag time between sequences. The central valve is a detachable piece that allows a single worker to disconnect it without the need to remove the tank, for faster and easier maintenance. A ten-bank positive solenoid control panel — which can be located as far as 200 feet (60m) away from the tanks to avoid harsh conditions — is connected to the facility’s programmable logic control (PLC) software. It allows operators to control and monitor the proper firing time and sequence remotely from a central location. To eliminate the risk of unintentional firing due to drops in pressure, the valve requires a positive signal from the solenoid in the form of an air pulse to trigger discharge. According to operators, installation only took a couple days and was scheduled with other projects that also required downtime. After some testing, a workable firing sequence that suited most weather conditions was implemented. resulting in continuous mill operations with minimal unscheduled downtime. Moreover, the area around the chute is reported to need only routine cleanup and maintenance accompanying normal scheduled inspections. Proven to be able to withstand the demands of the, strong Texas storms, the cannons are discharged when needed, increasing and decreasing in frequency with seasonal weather fluctuations. Along with hundreds of air cannons, Martin Engineering has also equipped the Hunter Cement plant with conveyor accessories and bulk handling solutions. Founded in 1944 and headquartered in Neponset, IL — with divisions on six continents — the equipment designer and manufacturer is the world leader in flow aids and conveyor products for a wide variety of bulk material applications, including cement, coal, rock/aggregate, biomass, grain, pharmaceuticals, food and other materials.